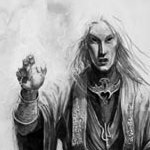 Ulthuan • View topic - What do you think of the new Prince Imrik? What do you think of the new Prince Imrik? Post subject: What do you think of the new Prince Imrik? So you have your big beautiful dragon model, BUT your facing an Empire army with three cannons, every dragons worst nightmare. If it's a Prince and Star Dragon...it doesn't look good. In one turn, assuming all hit, all three will wound on 2+ and do an average of 3.5 wounds each and the dragon will suffer 10.5 wounds on average. The same cannonballs will simultaneously hit the rider, who might save one or two with a ward save, but his armor will count for nothing and he's odds on to die. I'd guess the Prince on Star Dragon dies 60% of the time when facing 3 cannons. Same situation with Imrik: Assume all three hit, he will on average save one with the 5+ ward. Your opponent will need an awful lot of luck to get 10 wounds. I'd guess Imrik dies 15% of the time when facing 3 cannons. If taken in an army with Life and High magic and Khaine magic rules, a combination of spam life spells and boosted Apotheosis should get Imrik's wounds back easily the following turn. He should easily survive long enough for him or something else to kill the cannon crews then he can mop up the rest of the army. Bear in mind that this 3 cannon set up is the rare, nightmare scenario for a dragon, and most armies won't have anything like that level of monster killing firepower. The other fear would be a full Coven of Light, which with a S7 banishment will average 7 hits, 3 or 4 wounds each, he will probably need 3 successful Banishment's to finish Imrik, very unlikely to happen in a single turn, and you could heal those wounds back if he gets through one or two. If your packing Life magic you also have the option of flesh to stoning Imrik and making him largely Banishment proof. Imrik doesn't really have much else to fear. He will carve through absolutely everything. Ten S10 attacks on the charge with Always Strike First, re-rolls through high initiative, re rolling 1's to wound through Murderous prowess (in a Host of the Eternity King). Rubber lance syndrome is no worry either, ten S7 attacks is still better than anything else in the game. If I want a big dragon (and my name is Ladril Caledor so...yeah) I'm not sure I can find any reason to take a 650 point Prince on Star Dragon over Prince Imrik. The Lord of Dragons costs a little more, but hits much harder and is far less vulnerable. Post subject: Re: What do you think of the new Prince Imrik? I think Curu Olannon has used him - check his blog here on Ulthuan. I disagree with you on the use of him over the armybook Prince on Star Dragon. 810 points precludes you from taking an Archmage unless you're playing high points games and IMHO, you need a level 4 at anything above say 1500pts. Level 2's just don't cut it in my experience. I'm not sure he adds enough over the standard to make those extra 200 pts worth it. Imrik is good. By normal standards, broken good. The problem with Imrik is that if he is allowed, you will likely see Malekith and Karl Franz allowed as well. While Imrik is broken good by normal standards, in an ET meta he is just decent, I believe. It does depend on point levels though, at 2200 he has the unique ability of allowing you an L4 as well for example. I've read your army blog but I haven't seen Imrik. Did i miss that part? I consider 2400 points to be average and there's room for a fully tooled up Archmage to go with the Lord of Dragons. I think they designed him to be 810 points with that in mind. At 2400 you can actually just about squeeze in Alarielle Isha for supreme Imrik healing. I was thinking of supporting Imrik with a High Archmage in a Helmbus, and a unit Sisters of the Thorn. This gives High and Life healing with the mobility and survivability to stay with Imrik. I find Arcane Unforging can totally nerf the other ET super characters if needs be, while Imrik is still pretty good if he loses his items. Check the first page, there is an overview of the games I've played there. 2 reports with Imrik in one post. 2400. L4 High? Arcane is dodgy to rely on because of how quick things will happen. If you can keep dodging combat, as is possible with an all-fastcav army for example, it's ok. With a helmbus though any big, nasty dudes can just point and click on your bus with impunity. Also, High does very little vs Nagash. My preferred choice is Metal. That said, I have little experience with these type of games yet. Can you take Imrik in a non ET army? Unfortunately no. He is only available in a Phoenix King or Host of the Eternity King army, which means only End Times. Now, technically speaking if you agree to a game of Warhammer want to use these rules your opponent has to agree to them, buuuuuuuut, I wouldn't count on that happening. Rules or not, many people seem pretty upset by the End Times rules for some reasons unbeknownst to me.